Spatial cognition is a broad field of enquiry, emerging from a wide range of disciplines and incorporating a wide variety of paradigms that have been employed with human and animal subjects. This volume is part of a two- volume handbook reviewing the major paradigms used in each of the contributors' research areas. ; This volume considers the issues of neurophysiological aspects of spatial cognition, the assessment of cognitive spatial deficits arising from neural damage in humans and animals, and the observation of spatial behaviours in animals in their natural habitats. ; This handbook should be of interest to new and old students alike. The student new to spatial research can be brought up-to- speed with a particular range of techniques, made aware of the background and pitfalls of particular approaches, and directed toward useful sources. 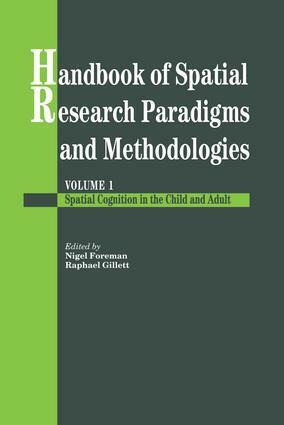 For seasoned researchers, the handbook provides a rapid scan of the available tools that they might wish to consider as alternatives when wishing to answer a particular "spatial" research problem.